The Court of First Instance renewed a temporary injunction issued three weeks earlier against pro-democracy protesters in the Mong Kok and Admiralty district on Monday. The police have been authorized to help the bailiffs see out the injunctions, and are scheduled to receive detailed instructions in court on Thursday. This means that the clearing of the protesters should begin on Friday at the earliest. 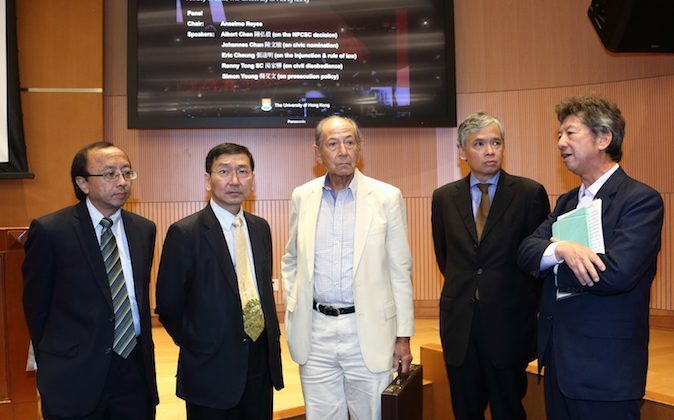 Johannes Chan, Dean of the University of Hong Kong’s Faculty of Law, and Mr. Justice Henry Litton, non-permanent judge of the Court of Final Appeal, raised similar concerns about the injunctions. Both Chan and Litton found it strange that a civil court process was being invoked for a public order issue, and wondered why the Hong Kong government did not take over from the bus and taxi operators who applied for the injunctions. According to the Chinese language Epoch Times, Chan said: “If the government feels that the [student-led occupation] is a public issue, then the Department of Justice should be taking up the injunctions. Chan also wondered whether the plaintiffs had the “finances to pay the 7,000 police officers” that will supposedly be mobilized. Another issue brought up by Litton and Chan was the manner in which the case was first heard. Speaking in a personal capacity, judge Litton said that he was “intrigued” that the high court granted the original injunctions on Oct. 20 on an ex parte basis. An ex parte decision is one where the party affected was not present to defend their action. “The process of going to a court to seek an order behind the back of a person to be affected by the order is a most drastic remedy, because the unvarying principle of common law is no one’s interest should be affected without having been given an opportunity to be heard,” said Litton, according to the South China Morning Post. Chan and Litton noted that an ex parte hearing is only justified in urgent cases. Since the Occupy movement has gone on for more than six weeks and the plaintiffs did not act on the injunctions earlier, the case for urgency cannot be made. Litton also raised questions about the original court order for the Mong Kok site. While surveying Mong Kok on a rainy day to determine how “urgent” the situation was to warrant the injunctions, Litton found the soaked court order, written only in English and in a script that was “not easily legible,” in a plastic container. Former Tiananmen student leader Zhou Fengsuo believes that the drive for democracy will endure in Hong Kong even if the protesters are cleared off the streets. Are "foreign forces" behind the students' supplies?